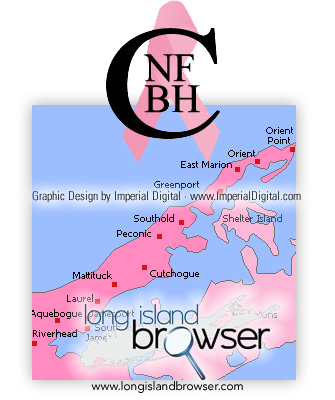 The North Fork Breast Health Coalition (NFBHC) on Long Island, New York is working to encourage and assist in the prevention, early intervention and cure of breast cancer through advocacy, awareness, networking and research. The North Fork Breast Health Coalition (NFBHC) is working to encourage and assist in the prevention, early intervention and cure of breast cancer through advocacy, awareness, networking and research. The The North Fork Breast Health Coalition (NFBHC) is involved in conducting educational outreach programs at health fairs and other community forums. Members of our speakers' bureau provide educational programs at local schools, churches and civic organizations. We are a group of concerned citizens working in conjunction with other community resources. As a not-for-profit organization, we have no paid employees, but rather return all funds raised for services to those diagnosed with breast cancer on the North Fork. We are committed to finding an answer to the high incidence of breast cancer in our area. Our primary goal is to increase community awareness of the many issues involved in the battle against this disease which kills more than 180,000 women a year in this country. In addition to helping identify the causes of breast cancer, our goal is to educate women about the importance of self-breast exams and annual mammograms as preventive measures. Our objective is to have 100% of the East End female population, age 16+ performing self-breast exams and 100% of the female population age 40+ receiving annual mammograms. Tags: North Fork Breast Health Coalition, NFBHC, breast cancer, Long Island, New York, Long Island breast cancer, breast cancer prevention, early intervention, cure, advocacy, awareness, networking, research, support, cancer fundraiser, charity benefit fundraiser, cancer fundriaser events.